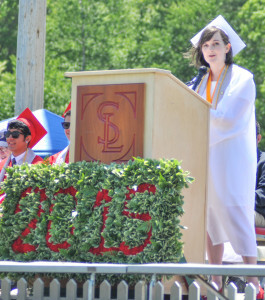 Sarah Coady of Halifax Class Valedictorian speaks to her classmates as they graduate from Silver Lake. 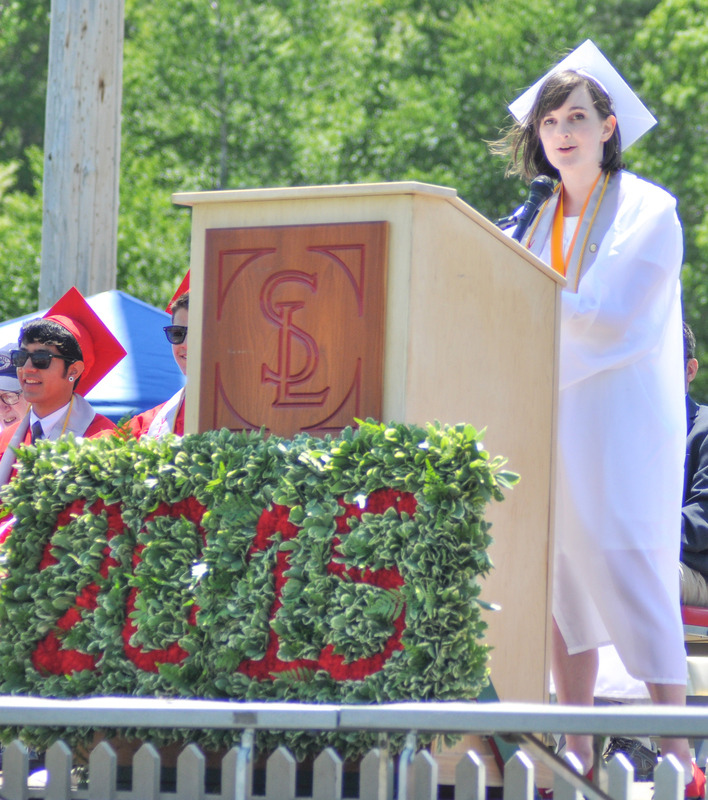 Two hundred seventy nine Silver Lake High School students graduated on Saturday May 30, in an outdoor ceremony. Sarah Coady of Halifax, Valedictorian of the Class of 2015, addressed her peers as she talked about time and the unknown future; although they all share a similar journey, there have been so many different paths along the way. She spoke of choosing colleges, homes, and careers, a reminder of the many challenges and changes she and fellow classmates will face. Cheers of support broke out in the crowd as she fought back tears during her speech. In the high school newspaper, The Senior Spectacular, she described herself as a “Type A” personality who worked hard to leave her mark on the school, a student who has a drive for higher education and will be attending Harvard University in the fall. She recalled as a freshmen how many students walked in to the wrong classroom, and described learning pickle ball as the most confusing game ever. She also remembered the hours they had all spent on countless tests and written papers. “We fell in love and out of love and over the last 18 years we learned to walk, talk and smile,” she said of their journey. Michael Phan of Kingston, Class President of 2015, spoke to guests and fellow classmates, reminding them of the sheer panic when they first realized they had outgrown recess and told about the funnier things they encountered throughout their school careers. “As freshmen we thought our school would be full of upperclassmen bullies, a school labyrinth with never ending halls.” He created the image of being stranded in a place with no cell phone reception and humorously being swept up by the janitor at the end of the day. “Then we realized the whole school is basically one big square,” he said the crowd roared with laughter. “We are here on this stage … we are still growing,” he said. Although we all are graduating together into different lives, I urge you to go into this new chapter of life – serve, learn and grow,” he said. See more photos of the SLRHS graduation on our Facebook page.